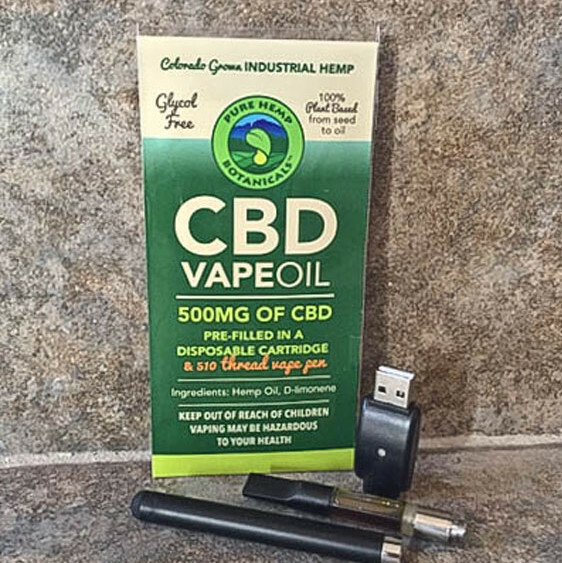 Enjoy the benefits of hemp with Pure Hemp Botanicals’ CBD Vape Oil. This package includes a pre-filled disposable cartridge of hemp oil containing 500mg CBD, 510 thread vape pen and charger. It’s glycol-free and 100% plant based from seed to oil. Serving size 2.5mg. This product contains one pre-filled disposable cartridge containing 500mg of CBD, a 510 thread vape pen and a charger. 100% plant based from seed to oil, this product is derived from 100% industrial hemp, organically grown in Colorado. Serving size is 2.5mg, and it’s glycol-free. This product contains hemp oil and D-limonene, and with less than 0.3% THC per serving, it’s non-psychoactive. Vaping may be hazardous to your health.